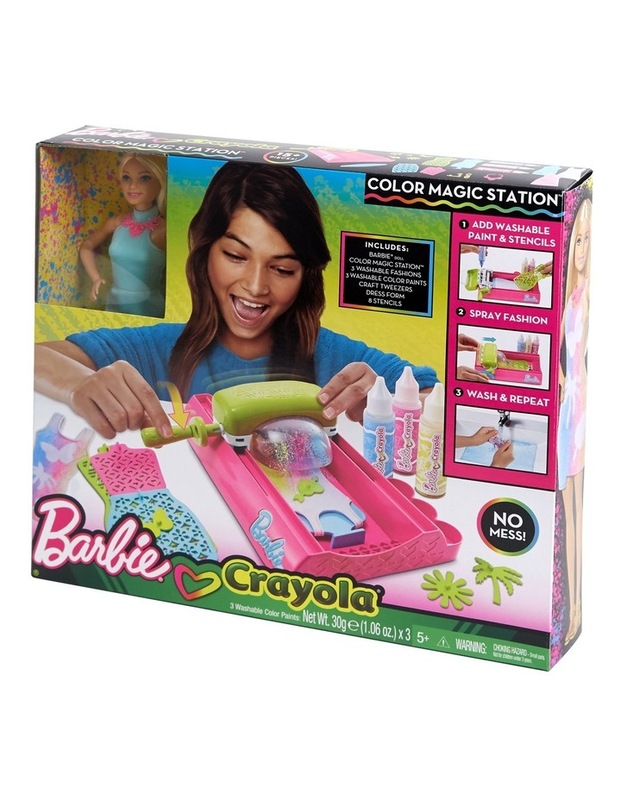 Create unique, colorful fashions for Barbie with the Barbie Crayola Color Magic Station doll and playset. Designing is easy! Choose one of the three included fashions each trendy dress is washable to allow for endless fashion designing fun. Place the fashion on the dress form and place the dress form in the Color Magic Station. Then choose your stencils, and place them on the fashion. Each set comes with one full-length stencil, two half-length stencils and five smaller icons, like a butterfly, heart or and palm tree. Next, pick a Crayola paint color (pink, yellow and blue are included), add it to the paint compartment and close the lid. Turn the handle while pushing it forward to create a colorful, mess-free, paint-splash effect. Use one or more stencils. Try one or more colors. You decide because youre the designer! When done designing, remove the stencils with the tweezers and reveal your finished look. Its so cool! Dress Barbie doll in the finished fashion and accessorize with the included shoes and necklace. Wash the looks out to create a fresh canvas and design again and again! Young designers will love seeing their artistic ideas become wearable fashions for Barbie doll! Includes Barbie doll wearing washable fashion and accessories, two additional washable fashions, the Color Magic Station, one full-length stencil, two half-length stencils, five smaller stencils, three Crayola paint colors, and tweezers. Each sold separately, subject to availability. Dolls cannot stand alone. Colors and decorations may vary.